I think that could be intentional on Apple part (not to have eyes blinking realistically) since Memoji is trying to capture more of a cartoonish expression. To have eyes blinking realistically will make it more human rather than a cartoon character. Memoji is extremely smooth. Can't wait to use it. Very thorough! Thanks for the efforts! 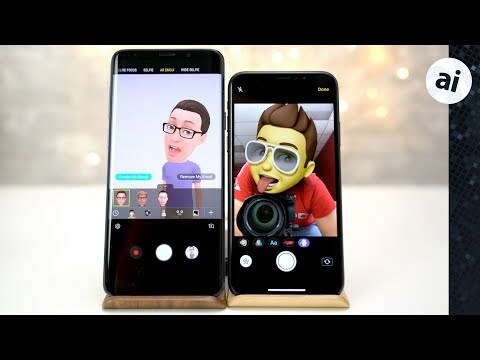 Samsung's attempt at doing this before they even have the correct facial tracking camera hardware on there phones is just another example of a rushed product, just like implementing the non secure facial scanner on the S8 before the iPhone X. Again and again Samsung does this with there products, the people are just use to it by now. These features will sell a lot of Face ID phones tho this fall for Apple, especially considering there will be at least three phones equipped for Face ID, teens are going to love this . Sammy rushing crap to the market like the flopped gear watch. I can not help myself, you wont like me but visually I like more Samsungs more realistic looking like face. Functionality is other thing. What I got out of all this is how horribly stupid and nonsensical Android share sheets are. It looks like it’s providing great sharing options at first glance but it’s all rubbish bloatware, unnecessary duplicated apps and options to share files to apps that would not be able to even read the file let alone extend a work flow to it. The whole system is a mess and everyone just praises it like it's Jesus coming back. Apple is superior in every aspect, everything is polished and well design. And now that they are taking bugs and slowdowns out, and making visuals more consistent throughout their OS they are even more ahead! Where's the AR in Samsung's Emoji? It starts with a picture of the subject, then gloms on limited "appearances" to customize it, and finally very simplistically follows facial expressions. Reminds me of 16-bit characters in '80s games, while Animoji from Apple is and looks 64-bit. I guess that is a clear expression of the differences between Snapdragon/Exynos and A-Series processors. Funny isn't it how quickly Apple overtook Samsung's processor design capabilities. I thought about that, but then I realized that only one of them has anything to do with Emoji, and that's Apple. What Samsung created in an avatar, not an emoji. I think it might be the black background ‘portrait mode’ look compared with the Ive standard white background. I wouldn’t call the face more realistic. It’s just a different style. It starts from your own photo... So, hey. A photo will look more "realistic" but that's not the point of this at all, so that's faint praise indeed. Great comparison article. Apple continues to produce quality software enhancements. But with Memoji/Animoji, they will definitely need to add sensors to all new iPhones to get more widespread usage of these features.